It is probable that the firm developed only one automobile, the big 7-seater touring car which was advertised in the December 1908 issue of the magazine Motor Age at $3,500. G. Marshall NAUL in The Complete Encyclopedia of Motorcars 1885 to the Present (ed. G.N. Georgano, New York, E.P. Dutton, 1973) states a manufacturing year of 1909 only, adding: "The Piggins was a very large car with wheelbases of up to 11ft 1in. 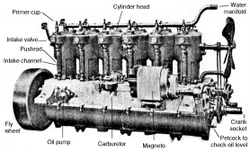 T-head, 6-cylinder engines of 36hp and 50hp were used. The latter unit was of 7.8 litres' capacity and drove a seven-seater weighing 3,700lb which cost $4,500." Kimes provides slightly different prices and wheelbase lengths for the two models: the 135-inch 50hp at $4700 and the 117-inch 36hp at $3500. Although the company boasted that vibration had been so reduced that a coin could remain on edge on the chassis while the engine ran, and Charles Piggins claimed in 1908 the motor would be inaudible a few metres away, this motor, with its external pushrods, would probably have been fairly loud and the large size of the unit meant it would have been a serious air polluter by today's standards. Piggins Brothers almost certainly did not have the coachmaking expertise to construct their own bodies, and would probably have had to contract out the more difficult tasks in engine-making as well. Their arrival in the business could scarcely have happened at a worse time, as a shakeout was coming to the automobile industry which destroyed the smaller manufacturers. The year before the Piggins car came onto the market, Henry Ford had begun production of the Model T in 1908 and created a mass market for automobiles. It is claimed that by the time Ford had made his 10 millionth car, nine out of ten of all cars in the entire world were Fords. A Model T cost just 850 dollars in 1909, whereas the less powerful of the Piggins cars cost 3,500 dollars, four times as much. In time the Model T became even cheaper. A market existed for what were dubbed "high hat" cars - very luxurious automobiles - but customers naturally expected proof of superb quality and reliability. In 1907, Pierce-Arrow, one of the United States' premium brands, had brought out their first six-cylinder car, the 65-Q Great Arrow with a 135-inch wheelbase. Its price gives some idea of the upper range of the 1909 market: from $6,500 to $7,750. One or possibly two of the 48-hp Pierce cars were bought by President William Howard Taft for the White House in 1909. The Piggins cost about two-thirds as much as the "presidential" brand, yet had no proven record in use. At the time, the Piggins was the biggest and most expensive car yet produced in Racine, according to Kimes. A few more cars may have been built - or at least sold - into 1910. We have no figures on how many of the Piggins passenger cars were made in all, but it seems likely that the number was tiny and that the project turned out to be uneconomic. 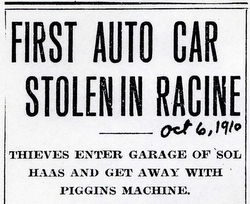 The auto was a Piggins car made in Racine, 1909. Its original cost was over $3,000 which is covered by an insurance policy for $2,500. The car was a 38-horse power, six cylinder, dark red color, leather top, folding glass window shield. The number was 6,540 W. The initials S.H. were painted on each of the doors. The stolen automobile was found abandoned in a suburb of Chicago today. The police receiving a telephone message to that effect this afternoon. Haas' chauffeur has gone down after it. Mr Haas has had bad luck with his car this season. About three months ago, while he and his wife were driving to Rockford, the car ran into a culvert near Beloit, throwing both occupants out of the machine and injuring them somewhat. Mr Haas has brought suit against Rock county for $5,000 damages. The case is now pending.